Can Israel Negotiate Freedom for a Soldier? Dealing with Hamas: Can the U.S. Avoid It? Ask Israelis how long it has been since Corporal Gilad Shalit was captured by Palestinian militants in Gaza, and they'll know exactly. On Monday, it was 995 days ago. On Tuesday, it will be 996 days ... The count is everywhere: on the front page of newspapers, on the TV nightly news, in school classrooms and in bright red numbers hanging from a tent that Shalit's parents have pitched outside the residence of the Prime Minister in Jerusalem. Time is running out. Olmert has only a few days left in office, and he has dispatched two envoys, including Shin Bet security services chief Yuval Diskin, to Cairo for indirect talks with Hamas, which may be hung up on details of an exchange. Those talks were extended until Monday night, raising the expectation that Hamas might agree to free the captive soldier, who is hidden somewhere in Gaza. "It's been very tough," Noam Shalit told TIME. "But we can't give up. I have no alternative but to be here, in this tent." 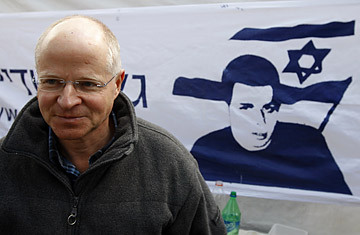 But as of Tuesday morning, the envoys had returned from the Cairo talks without a deal on Shalit's release. Diskin and the other negotiator, Ofer Dekel, are due to brief ministers at a special cabinet meeting Tuesday afternoon. Olmert, who faces possible corruption charges when he steps down and is blamed by Israelis for having led the country into inconclusive wars in Lebanon and Gaza, wants to end his term on a positive note. Shalit's release would do that. However, though the Egyptian-brokered talks are top secret, Hamas is said to be exacting a high toll for Shalit's freedom. Press reports say the Islamists are demanding that Israel release 1,400 prisoners in three stages, including "several dozen" serving life senteces for multiple killings. This pains Israel because it means that terrorists "with blood on their hands," as the Israeli press says, will be set free to possibly strike again. As one minister said, "When the names of these terrorists are released, the earth will shake." A prisoner swap would also be a boon for Hamas because it would be seen as a political victory and strengthen its position in power-sharing talks with its rival, Palestinian Authority President Mahmoud Abbas, who is backed by the United States and is acceptable to Israel. Arab and Israeli press reports say Olmert has reluctantly agreed to Hamas' list of prisoners but that he wants 90 convicted terrorists to be deported to Syria, Lebanon or elsewhere and another 30 Palestinians to be released in Gaza, not to their homes in the West Bank. Hamas supposedly refuses to make these concessions. Hamas sources told TIME that the Islamists are divided over their response to Israel's offer. The split is between the exiled leadership in Damascus and the political and military wings in Gaza, which took the brunt of the Israeli offensive in the coastal strip. "Why should we give Olmert a farewell gift?" says one Hamas official close to the exiled leaders in Syria. "After all, he launched attacks on Gaza and killed many of our men." The Hamas commanders in Gaza are more pragmatic. Several press reports had Hamas' military commander, Ahmed Jabri, whose men hold Shalit, joining the Cairo talks. The Gaza leaders believe Shalit's release could speed up the opening of the border-crossings into Gaza, allowing in materials to rebuild the enclave. Also, confided one Hamas official, "We're getting tired of holding Shalit. The Israeis haven't stopped trying to release him by force." On Tuesday morning, Olmert left his residence to share the results of the Cairo negotiations with his cabinet. If there is an eventual deal, the cabinet may then vote on whether Israel should agree to Hamas terms' for a prisoner exchange. It will be Olmert's last chance to redeem his scandal-ridden tenure as Prime Minister. And like a shadow  or a guilty conscience  Noam Shalit will leave his tent and follow Olmert to his office. There, Shalit will take up a position on a wooded hill across from the Premier's window to remind Olmert that, above politics and all else, it is the life of his son that hangs in the balance. On Tuesday, it will be 996 days and counting. Read about the rift between Hamas and Fatah.